The new council, Canning’s first in three years, will meet only once between the date of being elected and the WBA’s deadline on a commitment to funding up to $3.5m for its expansion, that we presume the candidates who have sought WBA’s “endorsement” have agreed to work to. We’re not sure what “equitable” means here – the Council is expected to cough up considerably more than the many clubs and members who lease this facility – including across Perth. That cost will still be borne by Canning’s ratepayers, alone. However this call for expansion of existing facilities to cater for future growth is being made despite the fact a state-of-the-art new facility for basketball – perhaps even an outstanding new home for WBA? 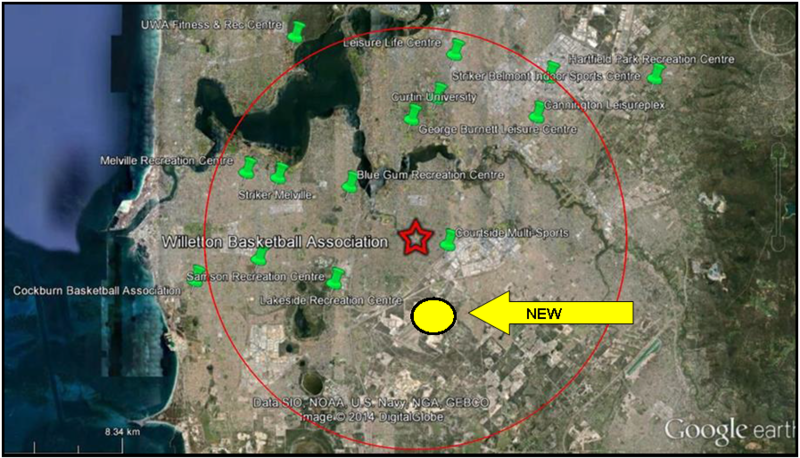 – is being worked towards now, by the City of Canning, with the capacity to serve a wider range of sports, meet the regional sporting needs of 10,000 or more, funded not only via state and federal bodies, but potentially the overlapping Council catchment areas of Armadale, Serpentine Jarrahdale, Gosnells and Cockburn. A regional complex like this may also help sway the case for the next heavy rail project in Perth, after the airport, to be the relatively cheap and short extension of the Thornlie Spur Line, through Canning Vale to the Mandurah Rail Line (flagged as first priority short-term project by Barnett Govt and a priority under MetroNet by Labor – we will expand on this soon). Our understanding is the oval of the new complex could host entities such as the Glory soccer team, who were negotiating with Curtin University a while back to do same – in part because of the parking availability to cater for 000s of fans. New bus priority lanes planned for Ranford Road, new rail and potentially thousands of bays at a new Canning Vale Train Station would help service the needs of a major sporting arena. ….but we are not sure the City can afford to do both and the WBA’s policy of choosing not to turn away prospective new players if it can help it (currently it is using satellite courts to meet need), could find its overflow accommodated at an outstanding new facility of which the City of Canning would boast ownership of. Several former councillors are running for this election, most of whom have advised they’ve learned not to make promises on anything prior to getting on to council. The exception here in Stephen Boylen, who was on the just-passed council (but chose to resign rather than see the investigations through to the end) – Mr Boylen has now been endorsed by WBA for giving his commitment to help push through their funding bid. But what the Heck, it’s an election, right? So to the dodgy plays…. WBA held a “rally”, but was it about promoting itself or lobbying for one particular mayoral candidate? Mike Nahan was there calling WBA’s expansion bid “critical” and promising money, but then again its in his electorate and we go to election in 18 months…. And that flash new sports complex – that’s not in his electorate! *Statement from WBA’s written petition to the City of Canning. Well said Diana. the City is much bigger than the WBA and I trust the good citizens of Canning realise that use the vote responsibly. Willetton basketball stadium currently caters for 3,000 players a week, not including demand from high schools, badminton, children in school holiday programs. It seems that for 3% of the cost of the new $100m facility to cater for one third of its projected 10,000 members would be a cost effective outcome for the residents of Canning. Can you tell us why the City, in the absence of a council, appears unwilling to accommodate the cost effectiveness you refer to? I assume you would have been given an indication – help us understand this situation a little better. Also, how many of the 3000 players a week live in the Canning area? How many are over 18? I’m interested in gauging how many votes the WBA believes it will be able to contribute to the local govt election, to help with its issues?